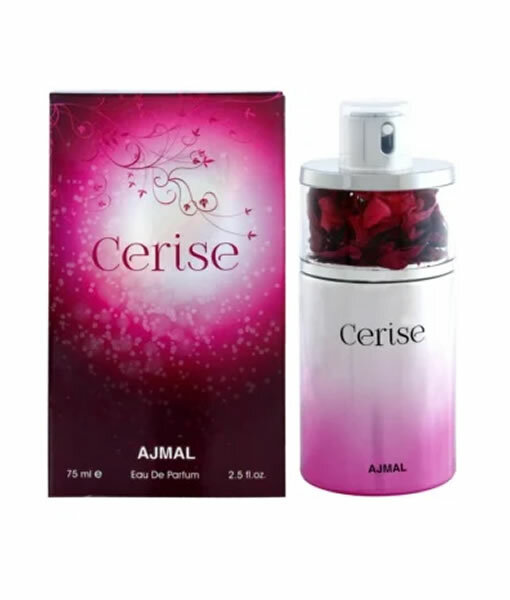 Cerise is a citrus gourmand perfume with fruity, sweet, ozonic, aquatic, fresh, and vanilla main accords for women. It is a blend of various fragrance notes, starting with top notes of melon, orange, and apple. The heart notes are strawberry, sugar, and coconut while the base notes are vanilla, musk, and amber. The fragrance has heavy sillage and is encased in bottle with a white-to-fuchsia ombre effect, actual dried flower petals in bright red shades in a separate compartment above the liquid, and a silver topper without a bottle cap.